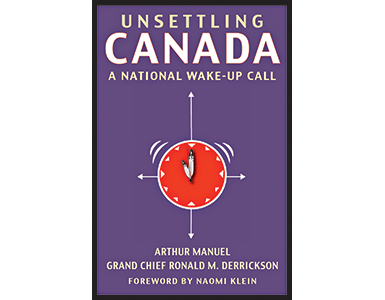 Unsettling Canada: A National Wake-Up Call by Arthur Manuel (Between the Lines) is, despite a Royal Commission-like title and a cold, logo-like cover, a helluva good read, in which smart people find ingenious ways to fight for change against a Canadian government that has been intractable, no matter which party is in power. Using his own life as a model and starting at the local level, Manuel traces the recent history of the indigenous rights movement. He explains how the job of chief is different from the job of mayor (can you imagine your mayor showing up when you get arrested? ), why non-indigenous government models won’t work for First Nations and why international pressure seems to be necessary before change happens in Canada. He lets us in on what’s behind the snippets of information that we get from mainstream media, namely that the Canadian government insists that our First Nations agree to the extinguishment of their land rights before negotiations on those land rights—whatever they might be—can begin. This “extinguishment” policy is so entrenched in federal and provincial attitudes toward treaty negotiations that the only recourse for those fighting for Aboriginal title is to work with other indigenous peoples around the world and to appeal to the United Nations, the World Trade Organization and Standard and Poor’s (one of the biggest credit-rating agencies in the world). It is only at this international level that Canada’s First Nations have found support for their arguments in favour of settling land claims fairly, although, up until a few days ago (mid-June 2016), the Canadian government has been registered as a “permanent objector” to the UN Declaration on the Rights of Indigenous Peoples. Not long before that, our new federal government agreed to sign the UN Declaration, which is an essential first step toward meaningful negotiation; only time will tell whether they are ready to negotiate in good faith. In the meantime, read this excellent book so you’ll understand what’s going on if or when change happens.